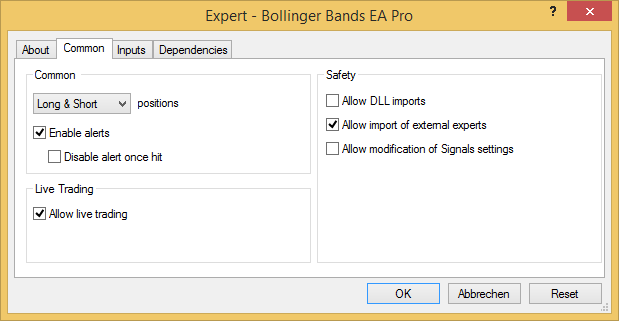 This little tutorial will show you how to install an expert advisor in Metatrader 4 & 5 if you have a compiled (.ex4 or .ex5) version. 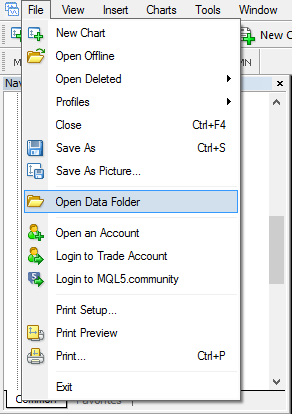 First open your Metatrader and click in the above left corner on “File > Open Data Folder”. Then restart your Metatrader. The Expert Advisor should show up in the Navigator under “Expert Advisors”. To open the Navigator click on “View > Navigator” or with Ctrl+N. Now double-click the EA or drag and drop it to the chart and the below window appears. 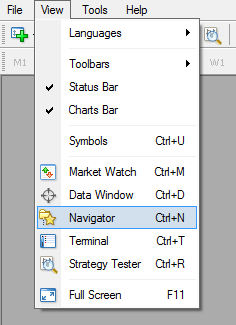 Allow live trading in the Common tab and set your settings in the Inputs tab and click on OK. The smile in the above right corner of the chart should now smile. If it doesn’t click on AutoTrading. Now you know how to install an Expert Advisor in Metatrader 4 & 5. You now only have to wait until a trade opens.